While Firestorm hasn’t appeared in the fantastic Tiny Titans comic book yet, here is what he might look like in that series. 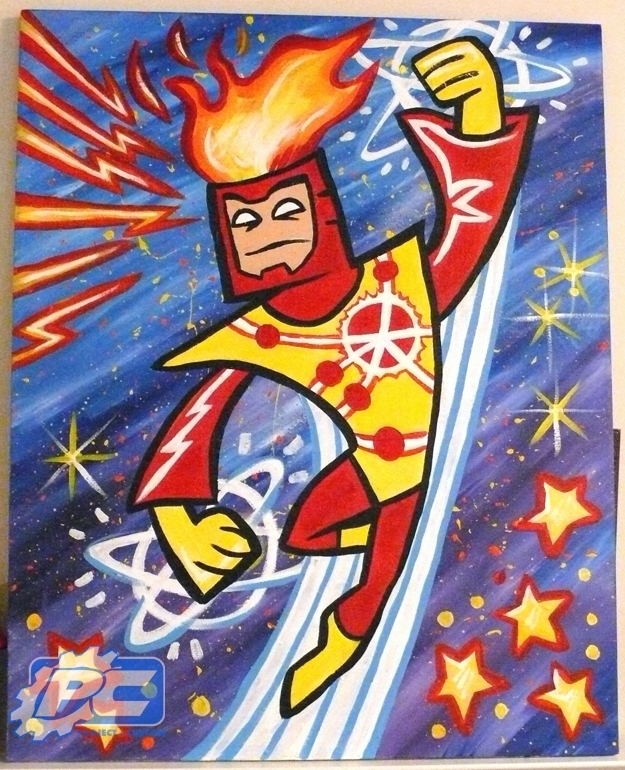 This painting was done by Art Baltazar, writer and artist on Tiny Titans. This one-of-a-kind painting was given to Vince of the Project: Custom blog in exchange for a custom Super-Skrull action figure. Sounds like a sweet deal to me! So while the Nuclear Man hasn’t graced the pages of Tiny Titans, we now have a pretty good idea what he’d look like in the series. Posted in: Comic books, Sketch/Art. ← Brightest Day Speculation – What’s Going on with the Nuclear Man? I wanted to pass along that I have nominated this blog for a Kreativ Blogger award. I think this is a great blog and overall site. It is so comprehensive and organized. One of the first comics I collected on a monthly basis was the Conway/Broderick Fury of Firestorm, so I have a sense of nostalgia for the character. I love visiting here.